Walking down a bustling New York street the day before Halloween with my then-three-year-old daughter, we turned a corner to encounter a masked man. He held up his arms and whispered “boo.” I shrieked. My daughter was unfazed—well, except for some confusion about the bizarre social interaction. While my eldest daughter is right at home in the world of Halloween, my youngest suffers from night terrors, and that’s without any help from houses bedecked with skeletons and giant spiders or hoards of masked strangers roaming the streets. If your child has similar fears, how do you navigate a holiday premised on bringing those things to life? And how do all of us support friends whose kids may have struggles with Halloween that go beyond our own? Talk with kids in advance to preview potentially scary situations (and increase kids' awareness about what to expect). Talk about any frightening encounters in the past, and identify and reality-test any specific fears or concerns. Underscore the fact that Halloween is about pretending—the scary things that you'll see on Halloween aren't real; they're pretend! Plan ahead and practice at home (e.g., try on costumes, practice how to trick-or-treat) to help your child feel more comfortable on Halloween itself. It also gives you another chance to underscore the fact that none of it is real. Similarly, spotting Halloween decorations ahead of time gives you additional opportunities to have this conversation about real versus pretend repetitively and in advance of Halloween itself. 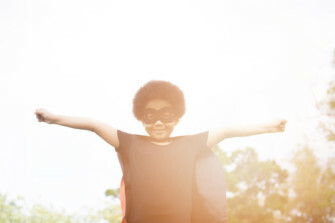 Focus on practical measures that set your child up for success. For example, we’re all better able to manage stress or worry when we are well-rested and fed. Making sure your child gets enough sleep leading up to Halloween can be helpful, especially if you anticipate a later-than-usual bedtime. And giving your child a meal or solid snack before you venture out trick-or-treating is essential to avoiding meltdowns. Encourage your child to participate in a way that feels comfortable or is just a bit of a stretch rather than avoiding Halloween activities altogether. Worry tends to feed on avoidance. For instance, trick-or-treating in daylight (and calling it quits before night hits) may be a successful experience for kids whose fears are triggered by the dark. Develop a plan with your child that addresses his or her specific fears or worries. Maybe you will agree to only visit houses in a specific neighborhood or those where you know the owners. Maybe your plan will be to always hold hands and go to the door with your child. Or maybe it will be for your child to stand with you while his or her siblings go to the door. Pay attention to your child’s cues for feeling worried or overwhelmed. You can give a prompt or reminder that things are pretend and just for scary fun (e.g., "Wow, that looks scary, huh? What did we talk about, is this stuff real or pretend?"). But if you see your child becoming increasingly emotional or fatigued, wrap things up or default to your pre-identified plan B. Have a pre-identified Plan B. The trick-or-treating or Halloween party isn’t working? Head home for popcorn, hot chocolate, and a dance party to Monster Mash (or whatever would be special for your child). 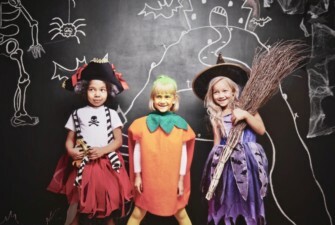 Your ultimate goal is for your child’s Halloween experience to end on a positive note! Concluding the evening with your child feeling successful and engaged will help lay the foundation for next year. Halloween can be scary for all kids. But for children with neurological conditions like ADHD, autism, or sensory processing disorder, this time of sugary treats, scratchy costumes, encounters with strangers, and unfamiliar masks and noises can be a nightmare. It’s also a struggle for their parents who are trying to balance holiday traditions with their children’s very real needs. Show some kindness. That child in regular clothes and his tired-looking parents probably aren’t lazy or lacking holiday spirit. They may have only just concluded an hour-long battle over whether the costume that was sufficiently comfortable yesterday is now “cutting” him. That child who had a meltdown when another kid stepped on her cape may not be poorly mannered. Instead, she may not have been able to control her reaction because her senses were already on overload. I guarantee you her parents are embarrassed and worried without the disapproval in your gaze. Leave the tricks to the kids (or at least get permission first). Unexpectedly turning off lights, popping out of dark corners, or touching someone’s body with a creepy prop might be fun-scary in a haunted house (except for surprise touching—that’s actually never fun), but it can be extremely upsetting for kids who haven’t opted in to the experience. Don’t be offended if a good friend declines an invitation to trick-or-treat or attend your holiday party because it would be “too much.” Instead, invite the child or family to join you for a more low-key activity at another time. Make sure there’s at least one quiet or calm spot available at your Halloween party. It doesn’t have to be anything elaborate. A pile of pillows and a few books or an out-of-the-way coloring station may be the difference between your friends staying at your party or leaving suddenly with a distraught child. Don’t pressure a child who is hanging back from the festivities. If a child looks at you in horror when you compliment her costume or show him the apple bobbing station, don’t force it. She may need to get comfortable with the situation before participating or maybe watching is his way of participating. But leave the kid a breadcrumb. “I’ll put your art supplies for the project right here for when you’re ready” or “Eva is so happy you could come. She wanted to introduce you to her pet snake.” Showing children that they’re welcome and can participate as little or as much as they want when they're ready goes a long way to making both kids and their parents feel comfortable. Modeling a little bit of kindness, empathy, and tolerance might just make the world a little less scary for all of us.